Have you noticed how technology has changed what you do at the office and at home? You probably don’t think about it much, as technology is so seamlessly integrated into our daily lives. Last month, ASQ Influential Voices blogger Manu Vora wrote about experimenting with new technology—namely Google Hangouts on Air—to share knowledge with a wide network of contacts at low cost. 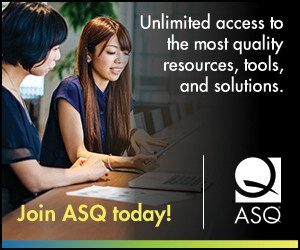 In July, ASQ bloggers reflected on how technology helps them as quality professionals—both at work and beyond. Aimee Siegler lists several ways in which technology has improved her daily life, such as making it possible to take online courses for her MBA. Pam Schodt shares seven practical ways to use the Internet for hobbies and professional development. Edwin Garro asks some of his university students—Generation X and millennials—for their top-used apps and websites. Luciana Paulise also shares a list of useful apps for quality professionals—and how PDSA fits into their use. Rajan Thiyagarajan writes about the power of social media, and Lotto Lai shares how the Hong Kong Society for Quality uses social media. John Hunter makes the case that the rate at which we incorporate new technology into our work is still very poor—how do we improve?